You wouldn't know it if you ran into me on an average day today but most of my adult working life was spent wearing a suit and tie and dealing with money. From taking phone calls from participants in retirement plans, my first job in financial services, to talking to participants in person at retirement meetings to managing bank branches for a pair of large banks to overseeing retirement plans with hundreds of millions of dollars, I saw up close the savings behavior of Americans and it wasn't a very cheery picture. Nor is my own outlook for retirement. I am less than 20 years from "retirement age" and the best I can hope for as I hit age 65 is to be out of debt and have some source of income that I can reliably count on even as I age out of the traditional workforce. 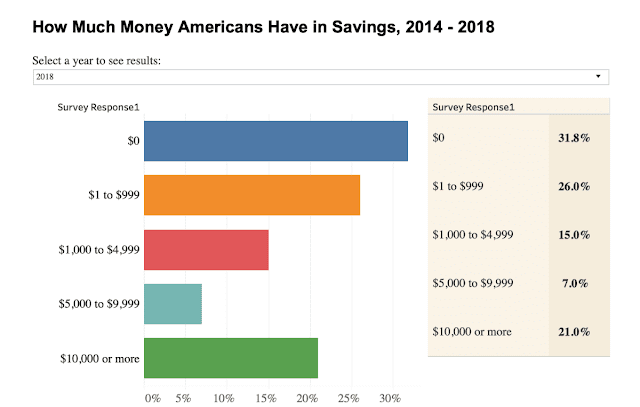 According to this, 72% of Americans have less than $5000 in savings and almost 60% had under $1000. My understanding is that this is the amount in traditional savings accounts. I would bet that the real numbers are actually worse, people tend to lie in polls especially when admitting you have no savings which makes you sound like an idiot (I am one of those idiots). It also leaves you extremely vulnerable to any sort of disruption. Thanks to job promoting policies, unemployment is very low and it is a great time to be looking for a job as employers are desperate for people who will show up to work on time and sober. If you can fog a mirror and pass a drug test, you have your pick of jobs. But the horizon looks stormy with elections coming up in 2020 and dimwits in the Democrat party proposing ever more insane ways to bankrupt the nation while bribing potential voters. Very few of us look further ahead than the end of the day and have no clue what to do in the event of serious financial calamity. It hasn't helped that for many years now regular savings accounts are paying next to nothing in interest, nor are CDs, thanks to insanely low rates from the Federal reserve. That has driven many people invest in riskier equities, which is fine as part of an investment strategy but not when you have no short-term savings and are reliant on borrowing from your 401k. Meanwhile the promise of retirement is turning out to be just another fantasy. Most middle-age, middle-class Americans are not going to retire somewhere sunny and play golf in their old age. I have been looking out a few years and there seems to be an impending convergence of Real Bad Stuff™ that should all be hitting at about the same time, maybe 8-12 years from now, including the insolvency of Medicare and Social Security. The Census Bureau currently projects that the baby-boom population will total 61.3 million in 2029, when the youngest boomers reach age 65. By 2031, when the youngest baby boomers reach age 67 (the age at which persons born in 1964 can receive full Social Security benefits), the baby-boom population is projected to be even lower, at 58.2 million. So in just a few years we will have almost 60 million Baby Boomers in retirement. Here is another pertinent fact. In 1964, when the last Baby Boomer was born, the U.S. was around 85% white, down a bit from the peak in the 30's and 40's when the U.S. was about 88% white. With the passage of the 1965 immigration "reform" act and the reduced fecundity of the heritage population, that percentage first started slipping and then went into free-fall. As of the last census in 2010 the white population was down to 63% and it is certainly lower than that now. In spite of what we are told by our coastal elites, people are not just interchangeable widgets. When you look at the average income of people living in America based on ethnicity you seem some troubling information. Asians, Jews and Europeans tend to be at the top end of the scale. On the bottom end of the scale, in the bottom 6, are : Somalis, Dominicans, Iraqis, Burmese, Mexican and Puerto Ricans. The people who tend to be higher earners for a variety of reasons we won't get into are also not having many babies and the people on the opposite end of the income scale, again we won't get into the reasons, are having a bunch of babies. Some more details from the WSJ: the average 65-year-old borrower has 47% more mortgage debt and 29% more auto debt than 65-year-olds had in 2003. That is not a great situation. No savings, historically high debt, tons of people entering the retirement system and fewer people making less money paying into the system. Oh, and life expectancy is probably going to start going back up soon so people will keep living longer. So what? That is a lot of bad stuff, doom and gloom. But so what? What does it mean? The internet is full of essentially all of the data ever compiled by mankind and most of it is meaningless. Here is my so-what: millions of Americans have worked most of their lives and are now in the middle-aged category. They have been dutifully showing up to work, paying taxes (especially Social Security and Medicare) with the promise of retirement. Lots of us, like me and my wife, started paying into those programs as teens in the 1980s. Most of us aren't planning on anything extravagant, just a quiet retirement with a little travel and spending time with grandkids. More and more it is looking like this was all just a lie. Many, perhaps most, of us will never be able to "retire" in the way we understood it: not having to work. I am not speaking of people who work odd jobs or as a greeter at Wal-Mart because they are bored, rather I am speaking about those of us who will have to keep working well beyond the magical retirement age of 65. We are starting to realize that we have been lied to over and over. The government lied to us as it looted the retirement system to bribe voters. The culture-makers lied to us by convincing us to not have kids while pushing to replace us with foreign workers that resent us and have no loyalty toward the people that built this country. Many workers trusted their unions to protect them but are finding out now that both private and public union retirement funds are in worse shape than Social Security as union officials negotiated ridiculous deals while lining their own pockets. 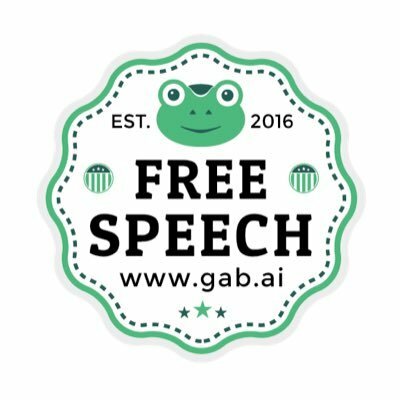 Most people are not aware of this yet. They are still caught up in the day to day stuff, raising kids and paying for college, just getting through the workweek. But they will start to realize this sooner or later. When they do they are going to be angry and they should. Tens of millions of us are going to pay hundreds of thousands into the Social Security system over our working life only to get to the age where it is our turn to start taking out only to find the coffers empty. The people responsible will be long gone for the most part and behind us will be millions of younger people living in America demanding their share of the shrinking pie. Of course a lot of this is our own fault. We should have been saving more for retirement but that is a tough sell. As part of my professional career I used to lead meetings for employers to tell their employees about the importance of saving in their 401k plan (the real reason for those meetings was to pump up participation in the lower ranks so the highly compensated employees could save more). I would travel around the country, from a factory the middle of nowhere in North Dakota to a swanky downtown Los Angeles law firm. Wherever I went I saw and heard the same thing. They understood how important it was to save but they probably weren't going to. The cost of daily life was too high and the demand for consumer spending was too great. Who wants to delay buying a new electronic widget today to save for some theoretical retirement in 30 years? Blame is where you place it but it isn't going to matter when people turn 58 and look out a few years and realize they see nothing but work as far as the eye can see with no prospect of retiring because the supplemental bit of income they were supposed to get from Social Security is not going to be there. Meanwhile younger Americans are demanding (and likely by that time getting) a "Universal Basic Income" for doing nothing, including people who are "unwilling to work" thanks to the "Green New Deal". The retirement crisis is a real one and it is going to be compounded by the identity politics that dominate our political landscape. Math is hard according to Barbie but it is real. In a story at Zero Hedge I recently linked to, US Budget Deficit Hits A Record $234 Billion As Interest On Debt Soars, I saw another graph that was worrying. 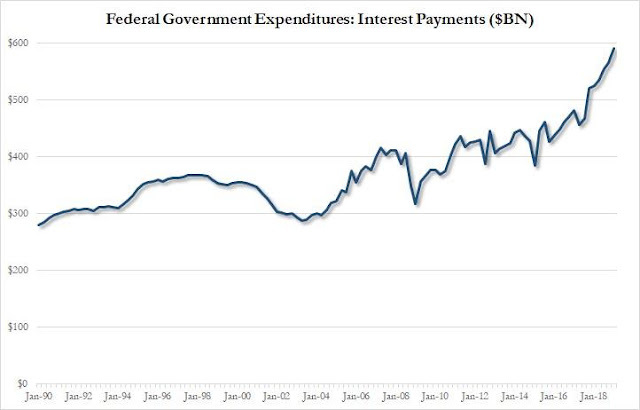 Finally, and perhaps most concerning, is that for the first four months of this fiscal year, interest payments on the U.S. national debt hit $221 billion, $19 billion, or 9% more than in the same five-month period last year. As a reminder, according to the Treasury's conservative budget estimates, interest on the U.S. public debt is on track to reach a record $591 billion this fiscal year, more than the entire budget deficit in FY 2014 ($483 BN) or FY 2015 ($439 BN), and equates to almost 3% of estimated GDP, the highest percentage since 2011. According to the same story we are only a short time away from the interest on the debt exceeding defense spending. Something will have to give. Do you think all of these swell "new Americans" being imported are going to have any loyalty to the old white people that built this country? They are fed a steady diet of racial hatred and resentment. If the choice is to cut back on their own social welfare programs or to cut back on the old people programs, which do you think they will choose? Make no mistake, we will have to choose. What will America do with tens of millions of elderly Americans who physically or mentally can't work but can't afford not to work who don't have access to the promised security programs? This is one of the most pressing problems for the mid-term future but no one is talking about it, as usual, and they certainly won't until it is too late. Why bring up a topic that you have no answer for and any suggested solution will doom your re-election? This is a problem with no solution and it is going to be a huge one. No one is coming to rescue you, so you better plan for a future with no retirement programs right now. This exactly dovetails with my thoughts. I wonder if the invading populace will care about the boomers at all? I'm betting that unless there is value stored (and I'm not sure it's money) there will be misery.